I feel that we, as the body of Christ are at least as accountable as they are for the lack of cost counting going on. I think that we (Christians, teachers, missionaries, etc) sometimes get so excited about someone accepting Christ (which don’t mistake me, is DEFINITELY something to get excited about) I think it’s very easy to get caught up in the world of exploding church numbers, converted refuges, youth groups outgrowing their building, and salvation on the mission field. But are we truly giving people a chance to see the true meaning of become a Christian. Of Christ living IN us. Do they understand that their salvation will be “worked out” over time and through many trials and tribulations. Has anyone told them that sometimes being a Christian is not glorious, rewarding, or even moderately comfortable, but sometimes it is suffering, sacrifice, and perhaps even despair that clings to the hope that Christ is at work. Do we allow people to see this whole picture? Or do we paint a pretty picture to “make God look good” so that people will want to be on His team. Seriously? It blows my mind that we think we need to make God look good, and yet I see it a lot, and I shamefully admit I am no exception. Ironically while counting the cost is a biblical principle, putting an all positive slant on God or Christian living is not. In fact the bible says we will take part in the sufferings of Christ and warns that we should expect to suffer/sacrifice for our faith. I think we often blow by these verses attributing them to monks & martyrs when perhaps God means for us to be applying them to movies and modesty. If you been following this blog you know I spent the better part of 2012 in a rural village in Guinea-Bissau (West Africa) and let me tell you what, I didn’t see a lot of moments where people were overcome by God and in an instant tore all the animistic charms from their children, smashed their little idol huts, stopped lying, cheating & stealing, became gentle and faithful husbands, etc but I did see a lot of MOVEMENT. I saw a lot of movement toward Christ. I saw believers questioning the status quo in their culture, cutting charms off their children, refusing to participate in the anamistic ceramonial washing after an unmarried woman gives birth, and loving those who persecuted them for their faith. I witnessed believers in various stages of their faith journey taking steps to make their life look more like the teachings of Christ. Truely allowing the Holy Spirit to renew their mind. And isn’t that the point? I would like to be clear about something. I’m not saying that God doesn’t ever change a man’s heart overnight. I’m sure it happens and who am I to say how God moves in someone else’s life. But I am suggesting that I think we should be aware, as a Christian church, that we can get really caught up in these glorious "moments" which are often quick to fade awaywhen the fruit which the Holy Spirit truly produces in someone’s life shouldn’t be confined in a moment but worked out in a movement. Picture this. You're sitting comfortably in your pew trying not to let your thoughts wander to the errands you need to run after church. Your pastor begins to preach, and boy is it a great sermon. Ya know, the kind that gets everyone stirring, but not because they're bored, because they're uncomfortable, in a good way! You begin to think about your life, and you know you've gone astray. As he brings his sermon to a close the pastor invites all who would like to accept Christ as their lord, or to recommit their lives to Christ to come forward. You know this is you. You should go... but just then the man next to you stands up. You're pretty sure he's a Christian, or at least he's been attending church every Sunday for about a year now. He comes to church with his child, dressed well, and knows the part. He clears his throat and everyone direct their attention toward him. "Good morning everyone. I would just like to say that I've been coming here for about a year now. I've learned a lot about God and his love for me, and I know I need his forgiveness in my life. The thing is, I really love going to the clubs to get wasted and dance provocatively with women on the weekends, and I know God doesn't like that, so if you'd like to pray for me I'm just going to continue to think about this a little more." Shocking isn’t it? Not so much that someone would think those things, but for someone to actually say them seems absurd, almost ludicrous. When I think about what the reaction may be if this were to take place in my own loving congregation, I'm not sure if there would be a deafening silence or an audible gasp. My church family is fantastic, but the perspective here doesn’t' reflect a lack of love by our church families, but rather a distorted perspective on conversion. You see in our culture I think we relish this magical defining moment where you decide to live for Christ and overwhelmed with spiritual enlightenment and live happily ever after. It seems we sometime mistake a proclamation of faith as a step into faultlessness. But the reality is that many, though emotionally stirred in their heart and perhaps truly moved by the spirit, are indeed longing for the God sized whole to be filled in their lives, but never commit with their head. Which produces a group of people rather easily enticed to get on the train but then after some rough track, have decided this train is really not for them and are quickly ready to get off at the next stop. So why does this happen? Are they just bad people? Flakey? Faking? Perhaps none of those at all. But rather they don't think about the way that this Christian “religion,” which is actually a relationship with a living God, will need to affect their decisions in town Friday night, or in a Tuesday office board meeting. The problem then is that when these moments arise, they're willing to explain away their choices and we so often accept their blubbering attempts to justify blatant sin. Or, perhaps they do all the right things for a while but at some point they are tired of juggling a balance, between their two desires.. The cognitive dissonance caused by the conflicting interests (to grow closer to God and to lead a self serving life) is more than they can bear, so they gradually grow distant from their church friends and stop showing up on Sundays, until you don't see them at all. So why does this happen? Why are these people leaving the body of Christ to serve themselves? They didn't count the cost my friends. It possible that they were misinformed and didn’t know it. Or maybe they approached it like that bill that’s been laying on the table for 10 days now and is about to be late but you can’t bring yourself to open it because you’re just so afraid you don’t be able to pay. Whatever the reason, one thing is clear to me. They didn't count the cost. 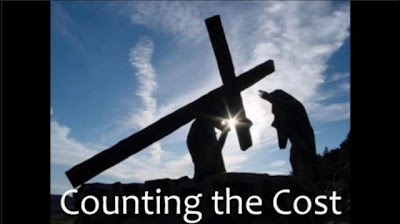 Though it may be socially unacceptable in our own church culture, it seems to me that counting the cost is a biblical principle. 25 Large crowds were traveling with Jesus, and turning to them he said: 26 “If anyone comes to me and does not hate father and mother, wife and children, brothers and sisters—yes, even their own life—such a person cannot be my disciple. 27 And whoever does not carry their cross and follow me cannot be my disciple. 28 “Suppose one of you wants to build a tower. Won’t you first sit down and estimate the cost to see if you have enough money to complete it? 29 For if you lay the foundation and are not able to finish it, everyone who sees it will ridicule you, 30 saying, ‘This person began to build and wasn’t able to finish.’ 31 “Or suppose a king is about to go to war against another king. Won’t he first sit down and consider whether he is able with ten thousand men to oppose the one coming against him with twenty thousand? 32 If he is not able, he will send a delegation while the other is still a long way off and will ask for terms of peace. 33 In the same way, those of you who do not give up everything you have cannot be my disciples. 34 “Salt is good, but if it loses its saltiness, how can it be made salty again? 35 It is fit neither for the soil nor for the manure pile; it is thrown out.